A large international presence and all-round expertise – this is what everyone associates with LIGNA HANNOVER. The innovative design and technology of the products and systems on display here, together with the high calibre and interna- tional provenance of the exhibiting companies, reinforce the global reputation enjoyed by LIGNA HANNOVER as the top event for the industry worldwide. Only at LIGNA HANNOVER are all the suppliers of technology for the timber and furniture industries represented. Only here will you find the world’s most comprehensive array of machinery and tools. And only here can you learn about the latest innovations, new products and production standards. 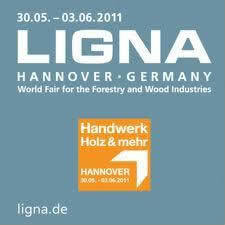 No other trade show anywhere documents the world of forestry and wood like LIGNA HANNOVER. Every stage in the value-adding chain for wood is fully covered here – from forestry technology and primary processing in the sawmilling and panel products industry to secondary processing in the skilled trades and industry and the use of wood in all its forms as a source of energy. Here you can meet international market leaders and top decision-makers from the forestry and tim- ber industry and establish valuable business contacts. A wide-ranging supporting program and themed special presentations make LIGNA HANNOVER an absolute must for all timber and forestry professionals, underlining the fact that LIGNA HANNOVER is also a showcase for forward thinking in areas such as sustainability, resource efficiency and conservation.